We get behind the wheel of the first of the 992-generation Porsche 911s to try out the new wetness detection system. Making its debut in the 2019 Porsche 911 (or 992 if you’re into model codes) is what the German company is calling a world first: a wetness detection system. This detects a wet road, warns the driver and advises that they then manually select the Wet driving mode. In the meantime, the PSM (Porsche Stability Management) and PTM (Porsche Traction Management) functions are automatically altered to suit the lower grip conditions. If the Sport Chrono Package has been specified (it’s optional, but you really shouldn’t buy a new Porsche 911 without it), the Wet model is selectable by twisting the steering wheel-mounted mode switch until the new digital instruments confirm that it has been chosen. Then, along with the PSM and PTM tweaks, the throttle response is softened, the rear spoiler is moved to its maximum downforce position (if you’re going over 90km/h), the cooling air flaps in the nose are opened and the rear differential’s characteristics are altered to prioritise stability (more so if the Porsche Torque Vectoring Plus system is part of the specification). If you don’t have the Sport Chrono Package (shame on you), the Wet mode is activated using a button in the bank of switches below the main screen in the middle of the dashboard. And how does all this feel? 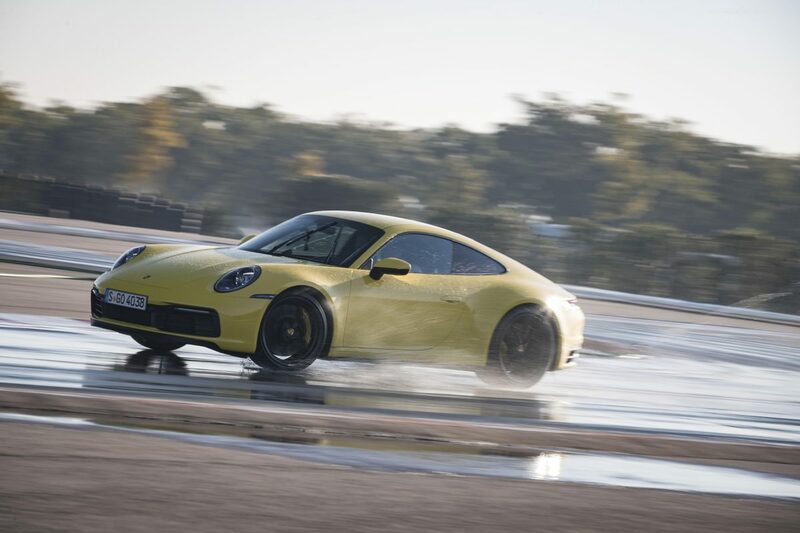 Well, to find out, we took the new Porsche 911 Carrera S onto a tight and twisty kart track with a sprinkler system keeping the surface soaked. 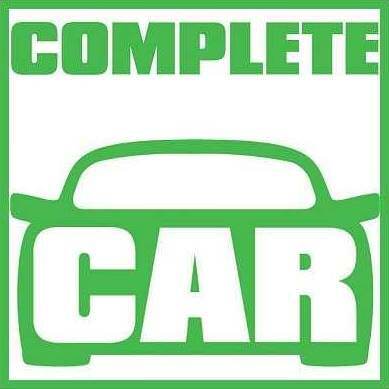 Select Wet mode and immediately, all nervousness is taken out of the car, making it feel safe and secure. Sure, the performance is reined in considerably to achieve this, but it means that this 450hp, rear-drive sports coupe is easily driveable in inclement conditions, regardless of your skill level. That’s all very clever and potentially useful, but how, you might ask, does Porsche’s new wetness detection system differ from that used by most car makers to turn on their automatic wipers? Well, they use optical sensors, ‘seeing’ droplets on the screen. The Porsche system utilises acoustic sensors in the front wheelarches that have been calibrated to ‘hear’ the sound of water splashing up from the road. Now, as we weren’t on a public road and there was plenty of run-off space at the track, we also took the opportunity to push the 911 to its limits on the same wet track, but in Sport Plus mode. This served to reveal the huge mechanical grip this car can generate, even in such conditions. Under provocation, it was possible to get the nose to push on a fraction (not much at all in reality), while on the exit of the tighter corners, small amounts of oversteer were easily controlled. Indeed, so clear is the communication through the new 911’s (electric-assisted) power steering that it was possible to skate around, just past the limits of adhesion, but not so far as to get the attention of the electronic nannies, making for a huge amount of fun. Our conclusion? The new Porsche 911 is better to drive than ever, yet also easier to drive for more people. Job done.